Gov. Bob McDonnell said Saturday that Virginians should continue to take Hurricane Irene seriously even though it weakened to a Category 1 storm and veered a little farther offshore as it churned toward the state's coast. "The next 12 hours are going to be very, very bad for Virginians," McDonnell said during a late-morning news conference at the state's Emergency Operations Center. McDonnell said that although Irene's sustained wind speed had slowed to about 85 mph, it is still expected to bring "historic amounts of rain'' to eastern Virginia. 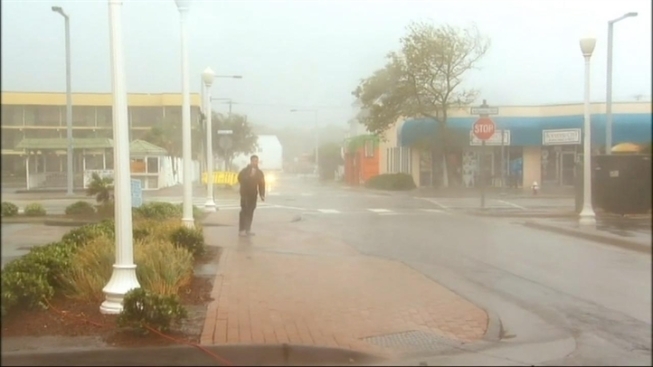 The Eastern Shore could get drenched by up to 15 inches, he said, and some localities could have tropical storm-force winds for up to 20 hours because the storm is moving relatively slowly. thousands of others left voluntarily, McDonnell said. 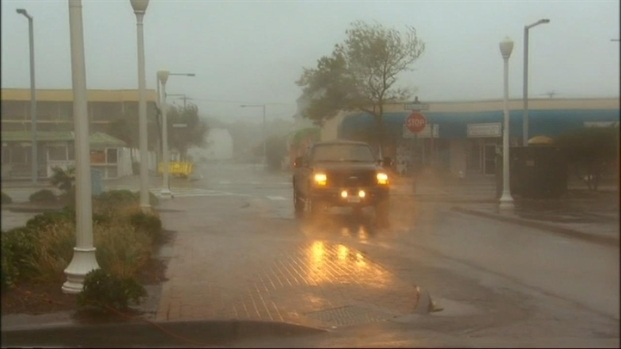 Video from Virginia Beach, Va., as Hurricane Irene blows through. In Virginia Beach, souvenir shops and other businesses along the resort strip were protected by sandbags and plywood nailed over windows. The usually bustling oceanfront was virtually abandoned as waves lashed the beach. The city had several shelters open, including one at an elementary school that housed about 100 people -- most of them homeless. McDonnell said a storm surge of up to 5 feet was expected, bringing serious flooding to low-lying areas along the state's coast. because of high winds. VDOT officials said both tunnels would remain closed until after the storm passes Sunday. official said the plan was to send a rope to the boat, but by the time rescuers assembled the apparatus to accomplish that the waves and wind had pushed the boat to shore. About 237,000 Virginians had lost electrical power by late Saturday morning, and McDonnell said that number was expected to increase substantially. McDonnell said authorities were concerned that Irene could produce tornadoes. Parts of eastern Virginia were under a tornado watch Saturday. that good fortune would not last. and getting emergency personnel into position. The Virginia National Guard had about 325 troops staged at various areas, with an additional 175 on standby if needed. Track the storm with our interactive radar. Share your photos with us and other readers. Check the latest severe weather alerts. Prepare yourself and your home for the hurricane. By the numbers: Hurricane Irene. Dramatic photos of the hurricane. Power outages: Info from your power company. Complete weather coverage and News4 video forecasts.